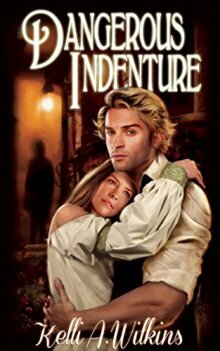 Today I’m sharing an excerpt from my historical romance, Dangerous Indenture. When I created the characters, I gave them all interesting backstories and unusual quirks. I had never written a romance set in Colonial times before and blending the romance with suspense/mystery was a lot of fun. The carriage driver’s words echoed in Shauna’s mind as she stared at the two-story stone building. The house didn’t look haunted. Why had the driver tried to scare her with tales of murder and madness? She’d come to the colonies to do a job, and she wasn’t about to be put off by a batch of superstitious nonsense. Shauna walked up the path to the front door, passing her trunk where the driver had dropped it in his haste to flee. She rapped with the brass knocker, waited a moment, then knocked again. There was no answer. Was anyone home? She didn’t fancy waiting outside all day. Curious, she peeked into the parlor to her left. The room was decorated with a horsehair sofa, an assortment of chairs and tables, and a thick wool carpet. “Oh my,” she muttered. Was everyone in Pennsylvania Colony so well off? A colorful painting of a garden filled with yellow roses drew her into the room. She admired the painting for a moment, then strolled around the parlor. Upon closer inspection, she noticed cobwebs dangling from the ceiling’s open beams, a gray tinge to the lace curtains, and stains on the light blue carpet. She frowned. The coach driver had been right about one thing—the house needed a servant. She recalled the rest of his strange story. She hadn’t asked who “that Purdy girl” was, and she didn’t care. It was none of her business. Besides, even if the house was haunted, she had no choice but to stay. “Who are you and what the devil are you doing in my parlor?” a deep voice thundered. She whirled around. A man with dark hair and a heavy beard towered over her. Joshua shoved her to the floor. Shauna rushed outside and opened her battered brown trunk. Her indenture papers were stacked neatly on top of her clothes. She picked up the papers and paused. Having second thoughts now would do her no good; it was too late to turn back. As soon as she handed these documents over to Master Stewart, she would belong to him for five years. It already seemed like an eternity. Part of her was tempted to march back inside and give her new “master” a piece of her mind, but she couldn’t. A fiery Irish temper and a loose tongue had caused her more problems than she could count. She didn’t need to start any new troubles here. As long as she lived at Stewart House, she would have to do as she was told. Besides, she had nowhere else to go. Shauna returned to the parlor and saw Joshua leaning against the stone fireplace, tapping pipe ashes onto the hearth. She handed him her indenture papers and flinched as his cold hand touched hers. Shauna followed him down the dark, musty hallway, catching glimpses of cabinets in the shadows. She trailed behind him as he made his way down the servants’ narrow steps. It looked as if the stairs hadn’t been used in years. Ropy gray cobwebs draped from the beams. Dust whirled around her skirts, tickling her nose. She coughed as she crept down the creaking staircase and found herself standing in the kitchen. Shauna hurried after Joshua as he marched through a swinging door and into a pale green dining room. She barely had time to glance around the room before Joshua returned to the parlor. “I’ll arrange for you to receive new dresses next week. And meals are provided, of course. I couldn’t expect you to go five years without food, now, could I?” Joshua chuckled. She jumped, startled by his deep laugh. Was that a joke? “I hope not, sir,” she answered, her voice trembling. “Very well, then. Get accustomed to the house. Your work begins in the morning,” Joshua stated, then left the parlor. Shauna gazed around the dusty room and sighed. What had she gotten herself into? Leaving Ireland to start over in Pennsylvania Colony had been the worst mistake of her life. Yet she had no choice but to begin her servitude in the morning. Joshua Stewart, master of the house, had spoken. Ashton studied the fair-haired girl half covered with a green quilt. In the dim morning light, she appeared ordinary and featureless. Why had he been attracted to her? Perhaps it was the wanton way she’d teased him with her tongue each time she kissed him or the sinful promises she had whispered in his ear. In any case, it didn’t take long for her dress to come off once they were upstairs. He glanced at the still-sleeping girl and felt a tug at his heart. Lord knew she deserved it for what she put herself through every night. He placed the coin on the edge of the dresser and slipped from the room, ignoring the rumbling in his stomach. I invite everyone to visit my site to catch up on my other romances, sign up for my newsletter, and email me with questions or comments. If you’ve read the book, I’d love to know what you think!